Foldable Solar Chargers are better suited for typically dry environments and must be dry when in use. 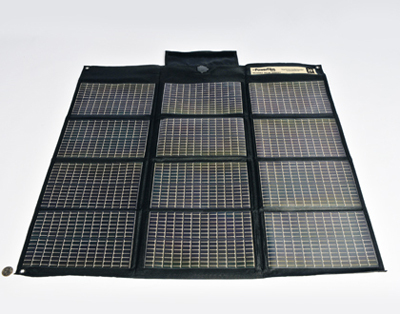 For marine/wet applications, please see PowerFilm's line of Rollable Solar Chargers. The 20W foldable solar charger takes you to the next level in portable solar power generation, increasing capability and charging speed while weighing less than 2 lbs. The 20W foldable solar charger provides you with a step-up in power point for solar charging small to medium electronic devices directly using the DC power or by utilizing one of many available accessories. Unlike "CIGS" solar technology, there is no need for "sun-soaking" the panel for optimum performance after periods of storage - so PowerFilm solar provides critical power immediately. 1. Place the charger solar-side up in the sun. 2. Connect your device to the charger using a male 12V CLA and the included female 12V CLA. 3. Optionally, the charger can be connected directly to a 12V battery for battery charging and power storage. Note - unlike the USB+AA and AA solar chargers there is no storage mechanism, meaning the charger will only produce DC power while in the sun.